For other military actions involving Newfoundland, see Newfoundland expedition (disambiguation). Entrance of St. John's harbour, 1786. Drawing by J.S. Meres. Courtesy of the National Archives of Canada. off Newfoundland, Labrador and Saint Pierre and Miquelon. The Newfoundland expedition (French: Expédition à Terre-Neuve, Spanish: Expedición a Terranova) was a series of fleet manoeuvres and amphibious landings in the coasts of Newfoundland, Labrador and Saint Pierre and Miquelon carried out by the combined French and Spanish fleets during the French Revolutionary Wars. This expedition, composed of seven ships of the line and three frigates under the orders of Rear-Admiral Richery sailed from Cadiz in August 1796 accompanied by a much stronger Spanish squadron, commanded by General Solano, which had the aim of escorting it to the coast of Newfoundland. On 28 August 1796 this combined Franco-Spanish squadron of 20 vessels, carrying 1,500 regular troops, appeared off the coast of Newfoundland. Considerable alarm was occasioned in England by the first accounts of these events in Newfoundland, the news being to the effect that the French had actually landed 1,500 men at Bay Bulls and 2,000 at Portugal Cove in Conception Bay, from which they were marching against St. John's., one of the most heavily fortified ports of North America, alongside New York Harbour and Boston, boasting one castle, five fortresses, six separate gun emplacements, and a defensive boom protecting the harbour's entrance. At St. John's the local garrison of the Royal Newfoundland Regiment, the Royal Artillery, the Royal Newfoundland Volunteers, aided by most able-bodied men, established a camp atop Signal Hill at the beginning of September. A boom was constructed across the harbour and three fire ships prepared. French Admiral Joseph de Richery, decided not to land after he saw this force, and after hovering in the area for several days, he chose instead to land at Bay Bulls, 18 miles south of St. John's, on 4 September. 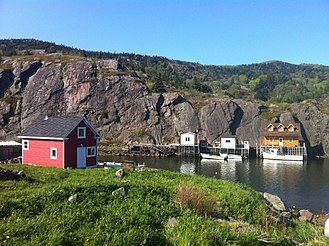 On 4 September the expedition entered the town of Bay Bulls, and there being no sufficient force to protect Newfoundland, it was ravaged with fire and destruction, and a great deal of mischief was done to the fisheries. After taking dozens of British prisoners, the combined fleet sailed toward Saint Pierre and Miquelon, which were held by the British at that time, and remained near the islands for two weeks, taking on water and preparing for the voyage back to France and Spain. The combined expedition destroyed over 100 fishing vessels from the Newfoundland fleet and burned fishing stations along the Newfoundland coast, including the base of the English garrison at Placentia Bay. On 19 August a treaty of alliance, offensive and defensive, between France and Spain was signed at San Ildefonso, by which the latter power was to have a fleet in readiness to assist the French. The treaty was ratified in Paris on 12 September, and on 5 October a declaration of war by Spain against Great Britain was issued from Madrid. The fleet, under the command of Don Juan de Langara, put to sea from Cadiz. Ten sail of the line under the flag of Rear-Admiral Solano were dispatched to join with a French force consisting of seven sail of the line and three frigates, under Rear-Admiral Richery, in an expedition against the British settlement of Newfoundland. In August 1796, both Canada and Nova Scotia were stirred by the news that Admiral Richery had escaped the vigilance of Admiral Robert Mann out of Cadiz, and was proceeding to Newfoundland with seven sail of the line and several frigates. 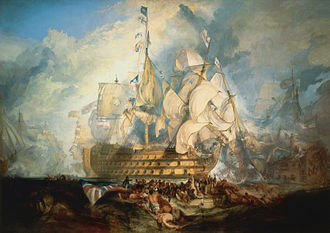 Against this force Vice-Admiral Wallace at St. John's could only oppose the old Romney of 50 guns, two 32's and two 16's. Captain Taylor, in Andromeda, of thirty-two guns, had parted for the banks with orders to cruise there for the protection of the sea trade. On 3 September he spoke with a schooner, the master of which informed him that he had seen on the coast an enemy's fleet, consisting of several ships of the line and frigates. Subsequent reports increased alarm on the mainland by telling of French landings in Conception Bay. Richery made for St. John's, estimating that with his superior firepower, he could pound Fort Amherst into submission. However, upon entering the harbour, he would have to contend with the three smaller forts William, Waldegrave, Chainrock, a guard tower, and one of the largest fortresses in North America, Fort Townshend. Therefore, landing on the interior of the harbour was not seen as a feasible goal. Outnumbered at sea, the British retired behind the forts and batteries of St. John's and prepared to put up stiff resistance. It was the morning of 2 September 1796 when the French fleet was sighted off the coast. Wallace did not have a large garrison in St. John's at the time, so he tried to give the impression that he had. This was intended to make the French believe that St. John's would be too costly to try to take. He had his men erect tents on both sides of the entrance to the Narrows and then marched them to and fro at Fort Amherst and below Signal Hill. Richery was handicapped by having no intelligence of the defenses of St. John's and no pilots for Newfoundland waters. He had to depend for information on John Morridge, master of a fishing ship belonging to Governor Wallace, who was one of the prisoners taken at Bay Bulls. Richery's huge fleet hove to off Cape Spear for a day observing the daunting sight. The next morning, Richery formed a battle line and drove for the harbour entrance. As they came within the range of the twenty-four pounders at Fort Amherst, his resolve weakened. Tacking the great ships, he headed back out to sea. The ruse had worked and the town saved. Admiral Richery's threat to St. John's finally came to nothing in face of the vigour of the new Governor, Admiral Sir Richard Wallace, who raised volunteers, strengthened the forts, and prepared new batteries. 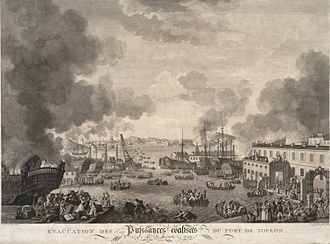 In France, the public were informed that Richery had forced the surrender of St. John's and captured large quantities of shipping and sent more than a thousand sailors as prisoners to Santo Domingo. 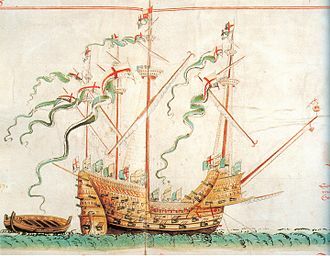 Not until October did authentic information reach England, when it was learned that the French admiral had given up the larger plan of an assault on St. John's and had left the coast on 29 September. 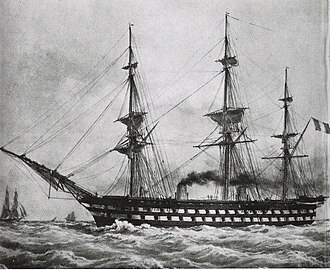 On 4 September the French squadron entered Bay Bulls. The town surrendered on their approach. Admiral Richery plundered and destroyed the entire settlement and shipping, including the fishing-stages, driving the inhabitants into the woods. 57 buildings and 47 fishing ships were captured along with more than 400 prisoners. On 5 September, Richery detached Adm. Zacharie Jacques Théodore Comte Allemand, to raid the Bay of Castles (Labrador) with Duquesne, Censeur, and Friponne while Richery himself proceeded to Saint Pierre and Miquelon with Victoire, Barras, Jupiter, Berwick, and Révolution 74s, and frigates Émbuscade and Félicité to visit a like treatment upon its shore establishments. On 27 September, Admiral Murray arrived at Halifax from Bermuda. Although the information presented to him was still confused, the apparent lack of transports and troops indicated that the expedition was a raid rather than a serious attempt to take Newfoundland. Two days later, Allemand stood away from the coast, and, as Richery had already done, steered homeward. On 5 November, Richery, with his division, entered the port of Rochefort, and on the 15th Allemand with his reached Lorient. The combined fleets of France and Spain had destroyed upwards of 100 merchant vessels, and taken a great number of prisoners. Some were sent in a cartel to Halifax, and the remainder, about 300 in number, were carried into France and Spain. 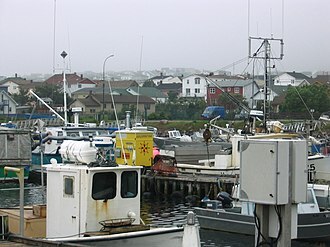 The British bank fisheries in Newfoundland recovered following the signing of the Treaty of Amiens in March 1802, and in that year, 71 Newfoundland and 58 British "banker" vessels prosecuted the fisheries on the Grand Banks. They declined again with the outbreak of war in 1803 and recovered somewhat after the Battle of Trafalgar in October 1805, but declined again during the Anglo-American war of 1812–14. The Spanish novelist Arturo Pérez-Reverte cites this expedition in one of his works, Cabo Trafalgar: un relato naval. Burke, Edmund. The Annual Register. Vol 38. Cust, Edward. Annals Of The Wars Of The Eighteenth Century: Compiled From The Most Authentic Histories Of The Period 3. John Murray. After an extraordinary charge across the frozen Zuiderzee, the French cavalry captured 14 Dutch ships and 850 guns. A capture of ships by horsemen is a rare feat in military history. However, some say that no battle actually took place. The French units were the 8th Hussar Regiment and the 15th Line Infantry Regiment of the French Revolutionary Army, jean-Charles Pichegru was the leader of the French army that invaded the Dutch Republic. 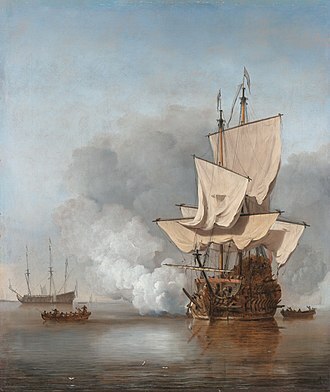 The Dutch fleet was commanded by H. Reintjes, the actual capture was accomplished by Jean-Guillaume de Winter and Louis Joseph Lahure. The action happened during the War of the First Coalition, part of the French Revolutionary Wars, Den Helder is located at the tip of the North Holland peninsula, south of the island of Texel, on what was the shallow Zuiderzee bay. The Zuiderzee has been closed off and partly pumped out in the 20th century, the French Army entered Amsterdam on the 19 January 1795 to stay there over winter. Well informed, the found out that a Dutch fleet was anchored at Den Helder. The winter of 1794–1795 was exceptionally cold, causing the Zuiderzee to freeze, Pichegru ordered General of Brigade Jean-Guillaume de Winter to lead a squadron of the 8th Hussar. De Winter had been serving with the French since 1787, General de Winter arrived at Den Helder with his troops during the night of the 23 January 1795. The Dutch fleet was there as expected, trapped by ice, each hussar had brought on the croup of his horse an infantryman of the 15th Line Infantry Regiment. After a careful approach to awakening the Dutch sailors, Lieutenant-Colonel Louis Joseph Lahure launched the assault. The ice did not break, and the hussars and infantrymen were able to board the Dutch ships, the French captured the Dutch admiral and the vessels crews, the French suffered no casualties. The traditional narrative of French cavalry storming and capturing the ships at Den Helder is primarily based off French sources, the Dutch historian Johannes de Jonge claimed that the Dutch fleet had already received orders on the 21st of January to offer no resistance. Coastal artillery is the branch of the armed forces concerned with operating anti-ship artillery or fixed gun batteries in coastal fortifications. The advent of 20th-century technologies, especially aviation, naval aviation, jet aircraft, and guided missiles, reduced the primacy of cannon, battleships. In countries where coastal artillery has not been disbanded, these forces have acquired amphibious capabilities, in littoral warfare, mobile coastal artillery armed with surface-to-surface missiles still can be used to deny the use of sea lanes. 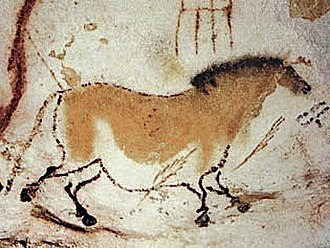 Land-based guns benefited in most cases from the protection of walls or earth mounds. The Martello tower is an excellent example of a widely used coastal fort which mounted defensive artillery, during the 19th century China built hundreds of coastal fortresses in an attempt to counter Western naval threats. Coastal artillery could be part of the Navy, or part of the Army, in English-speaking countries, certain coastal artillery positions were sometimes referred to as Land Batteries, distinguishing this form of artillery battery from for example floating batteries. In the United Kingdom, in the 19th and earlier 20th Centuries, following the Spanish–American War and the report of the Endicott Board, U. S. harbor defenses were greatly strengthened and provided with new, rifled artillery and minefield defenses. Shortly thereafter, in 1907, Congress split the field artillery, the first decade of the 20th Century, the United States Marine Corps established the Advanced Base Force. The force was used for setting up and defending advanced bases, during the Siege of Port Arthur, Japanese forces had captured the vantage point on 203 Meter Hill overlooking Port Arthur harbor. The battleship Sevastopol, although hit 5 times by 11-inch shells, after 3 weeks, the Sevastopol was still afloat, having survived 124 torpedoes fired at her while sinking two Japanese destroyers and damaging six other vessels. The Japanese had meanwhile lost the cruiser Takasago to a mine outside the harbor, the Blücher had entered the narrow waters of the Oslofjord, carrying 1,000 soldiers and leading a German invasion fleet. The first salvo from the Norwegian defenders, fired from Oscarsborg Fortress about 1 mile distant, disabled Blüchers main battery, fire from the smaller guns swept her decks and disabled her steering, and she received several torpedo hits before the fires reached her magazines and doomed her. Singapore was defended by its famous large-caliber coastal guns, which included one battery of three 15-inch guns and one with two 15-inch guns, AP shells were designed to penetrate the hulls of heavily armoured warships and were ineffective against personnel. The Japanese defended the island of Betio in the Tarawa atoll with numerous 203 mm coastal guns, in 1943, these were knocked out early in the battle with a combined USN naval and aerial bombardment. Nazi Germany fortified its conquered territories with the Atlantic Wall, the intent was to destroy the Allied landing craft before they could unload. During the Normandy Landings in 1944, shore bombardment was given a high importance, using ships from battleships to destroyers, for example, the Canadians at Juno beach had fire support many times greater than they had had for the Dieppe Raid in 1942. The Battle of Valmy was the first major victory by the army of France during the Revolutionary Wars that followed the French Revolution. The action took place on 20 September 1792 as Prussian troops commanded by the Duke of Brunswick attempted to march on Paris, generals François Kellermann and Charles Dumouriez stopped the advance near the northern village of Valmy in Champagne-Ardenne. The outcome was unexpected by contemporary observers – a vindication for the French revolutionaries. 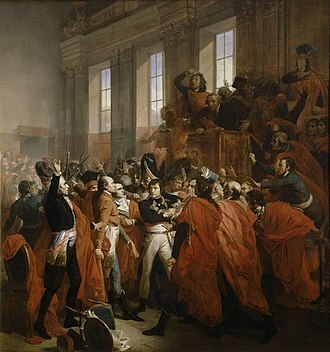 The victory emboldened the newly assembled National Convention to formally declare the end of monarchy in France, Valmy permitted the development of the Revolution and all its resultant ripple-effects, and for that it is regarded by historians as one of the most significant battles in history. As the French Revolution continued, the monarchies of Europe became concerned that revolutionary fervor would spread to their countries, the War of the First Coalition was an effort to stop the revolution, or at least contain it to France. King Frederick William II of Prussia had the support of Great Britain, the French commander Charles Dumouriez, had been marching his army northeast to attack the Austrian Netherlands, but this plan was abandoned because of the more immediate threat to Paris. A second army under General François Kellermann was ordered to link up with him in a mutual defense and these veterans provided a professional core to steady the enthusiastic volunteer battalions. Combined, Dumouriez Army of the North and Kellermanns Army of the Centre totalled approximately 54,000 troops. Heading towards them was Brunswicks coalition army of about 84,000, all veteran Prussian and Austrian troops augmented by large complements of Hessians and the French royalist Army of Condé. The invading army handily captured Longwy on 23 August and Verdun on 2 September, in response, Dumouriez halted his advance to the Netherlands and reversed course, approaching the enemy army from its rear. From Metz, Kellermann moved to his assistance, joining him at the village of Sainte-Menehould on 19 September, the French forces were now east of the Prussians, behind their lines. The unfavorable situation was compounded by bad weather and an increase in sickness among the troops. With few other options available, Brunswick turned back and prepared to do battle, the troops trudged laboriously through a heavy downpour – rain as of the days of Noah, in the words of Thomas Carlyle. Brunswick headed through the northern woods believing he could cut off Dumouriez, at the moment when the Prussian manœuvre was nearly completed, Kellermann advanced his left wing and took up a position on the slopes between Sainte-Menehould and Valmy. His command centered around an old windmill, and his veteran artillerists were well-placed upon its accommodating rise to begin the so-called Cannonade of Valmy, Brunswick moved toward them with about 34,000 of his troops. As they emerged from the woods, a gunnery duel ensued. The Prussian infantry made a cautious, and fruitless, effort to advance under fire across the open ground, as the Prussians wavered, a pivotal moment was reached when Kellermann raised his hat and made his famous cry of Vive la Nation. It played out in three phases and lasted from the spring of 1794 until 1800. The uprising was caused by the Civil Constitution of the Clergy. A first uprising attempt was carried out by the Association bretonne to defend the French monarchy and reinstate the specific laws, the first confrontations broke out in 1792 and evolved to a peasant revolt, to guerrilla warfare and eventually to full-scale battles until the Republican victory in 1800. Shorter peasant uprisings in other such as in Aveyron and Lozère were qualified as chouanneries. A petite chouannerie broke out in 1815 during the Hundred Days, the following spring, in the area around Quimper, a justice of the peace led several parishes in a rising in the name of King Louis XVI against the local authorities. During the summer of 1792, incidents occurred in the districts of Carhaix, Pontrieux, Craon, Château-Gontier and Laval, at Saint-Ouën-des-Toits, in the district of Laval, Jean Cottereau led the insurgents. His nickname probably came from his imitation of the call of the tawny owl for a recognition-signal, a reward was put on his head, but nevertheless he reached England in March 1793. The republican administration recognised him and his brother as the leaders of the revolt, in January 1794, the Vendeans of the Vendée militaire, following the setback of the Virée de Galerne, tried to resist the infernal columns of General Turreau. During this time, groups of Chouans north of the Loire took up again in the areas crossed by the Vendeans. The Chouannerie was born on the borders of the Mayenne and of the Ille-et-Vilaine, near Fougères, Vitré, condemned to live in almost total secrecy, the Chouans knew that being captured by the Republicans would mean certain death. Most of them were motivated by a desire to avenge their relatives who had disappeared in the Virée de Galerne, in guerilla warfare, Chouans in groups of a few score or a few hundred men ambushed military detachments and stagecoaches carrying government funds. They attacked Republican towns, executed informers, constitutional priests and republicans, to oppose the Chouans, Republicans built strongholds or fortified towns which were defended by local territorial guards. They were led by general Jean Antoine Rossignol, chief commander of the Army of the Coasts of Brest, a law enacted on 23 March 1793 mandated that captured insurgents should be executed by firing squad or by guillotine within twenty-four hours. Rossignol assembled groups of Fake Chouan outlaws in order to do as much as possible to discredit the real Chouans, murders were carried out throughout the whole war with a varying degree of intensity. For example, in the district of Fougères, in conflict between some 2,000 Chouans and a number of Republicans,219 people were assassinated or executed by Chouans and 300 by Republicans. This did not include deaths during fights, summary executions on the battlefield, the Chouannerie spread quickly to Brittany and reached the Côtes-dArmor, dominated by the Chevalier de Boishardy. On 15 March it reached Morbihan where Joseph de Fay and Béjarry assisted by Pierre Guillemot incited a peasant uprising aimed at Vannes, the insurgents were easily countered by the Republicans at the battle of Mangolérian. The French army paused in its retreat toward the Rhine River to savage the pursuing Austrians. The action occurred during the War of the First Coalition, part of the French Revolutionary Wars, Biberach an der Riss is located 35 kilometres southwest of Ulm. During the summer of 1796, the two armies of Jean-Baptiste Jourdan in the north and Moreau in the south advanced into southern Germany and they were opposed by Archduke Charles, Duke of Teschen who oversaw two Austrian armies under Latour and Wilhelm von Wartensleben. 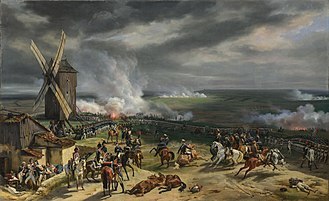 At the Battle of Amberg on 24 August 1796, after Jourdan was beaten again at the Battle of Würzburg on 3 September, Moreau was forced to abandon southern Bavaria to avoid being cut off from France. As the outnumbered Latour doggedly followed the French retreat, Moreau lashed out at him at Biberach. 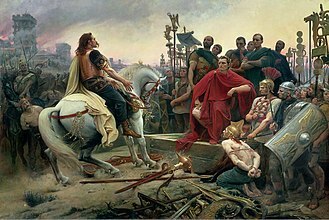 For a loss of 500 soldiers killed and wounded, Moreaus troops inflicted 300 killed and wounded on their enemies and captured 4,000 prisoners,18 artillery pieces, after the engagement, Latour followed the French at a more respectful distance. The Battle of Fishguard was a military invasion of Great Britain by Revolutionary France during the War of the First Coalition. The brief campaign, on 22 –24 February 1797, is the most recent landing on British soil by a foreign force. The French General Lazare Hoche had devised a three-pronged attack on Britain in support of the Society of United Irishmen, two forces would land in Britain as a diversionary effort, while the main body would land in Ireland. Adverse weather and ill-discipline halted two of the forces but the third, aimed at landing in Wales and marching on Bristol, in a related naval action, the British captured two of the expeditions vessels, a frigate and a corvette. General Hoche proposed to land 15,000 French troops in Ireland to support the United Irishmen at Bantry Bay, as a diversionary attack to draw away British reinforcements, two smaller forces would land in Britain, one in northern England near Newcastle and the other in Wales. In December 1796, Hoches expedition arrived at Bantry Bay, unable to land even a single soldier, Hoche decided to set sail and return to France. However, the invasion went ahead and, on 16 February. The Wales-bound invasion force consisted of 1,400 troops from La Legion Noire under the command of Irish-American Colonel William Tate. He had fought against the British during the American War of Independence, under his command was the Seconde Légion des Francs, more commonly known as Légion Noire due to their using captured British uniforms dyed very dark brown or black. Tates age has been misrepresented by most historians, following E. H. Stuart Jones in his The Last Invasion of Britain, in which Jones claimed Tate was about 70 years old, the naval operation was led by Commodore Castagnier. 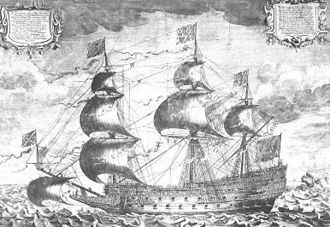 His four warships were some of the newest in the French fleet, the frigates Vengeance and Résistance, the corvette Constance, and a smaller lugger called the Vautour. Castagniers orders from the Directory were to land Colonel Tates troops, all were well-armed, and some of the officers were Irish. They landed at Carregwastad Head near Fishguard in Pembrokeshire on 22 February, in reality, the Legion Noire landed under the cover of darkness at the secluded bay of Carregwastad, three miles west of Fishguard. An Ottoman redoubt of the Dardanelles Fortified Area. The weapon is possibly a German-made 28 cm SK L/40 gun on a coast defense mount. 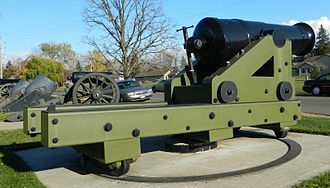 50-pounder Model 1811 Columbiad (7.25 inch or 184 mm bore) and center-pivot mounting designed by George Bomford as an experimental coastal defense gun. This gun was built in 1811 as a component of the Second System of US fortifications. 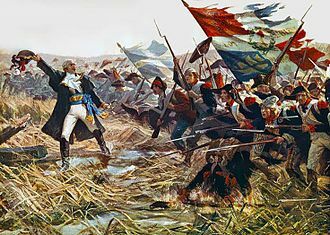 French commander Jourdan at the Battle of Fleurus. 1837 painting by Mauzaisse. 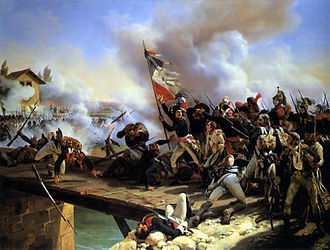 19th-century painting romanticising the Battle of Jemappes. An episode of the Chouannerie, painting by Jules Girardet, 19th century. The battle of Quiberon Un épisode de l'affaire de Quiberon (An Episode of the Quiberon affair), painting by Paul-Émile Boutigny, 19th century. La Chapelle de La Madeleine à Malestroit (Morbihan) - 15 nivôse an III (The Chapel of La Madelaine in Malestroit), painting by Alexandre Bloch, 1886. Jean Victor Moreau commanded the Army of the Rhine and Moselle. Archduke Charles, one of the Habsburg's best military minds, had overall command of the Austrian and Reichsarmee forces. Loss of his Eye Before Calvi, 1808. Print depicting the wounding of Nelson during the siege. NMM. The Austrians initially pushed out the French defenders, but a strong counter-attack forced them to retreat, leaving the French in possession of the village and the important bridgeheads crossing the Rhine River.